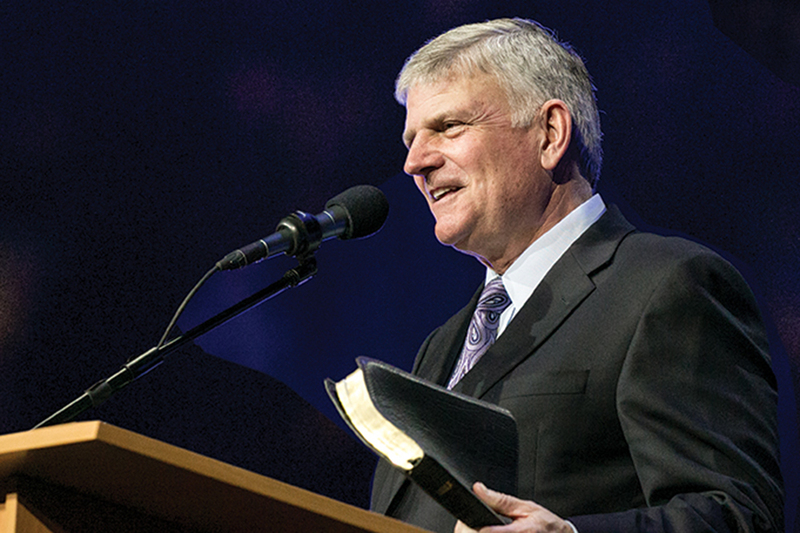 Sixty years after his father's historic Australia Crusades, Franklin Graham will travel across the continent, sharing the Gospel in six cities throughout February. You’ll find them scattered across the Australian continent, from the Sunset Coast to the streets of Sydney. The youngest are now in their 60s; others are quite elderly but still remember the moment that changed the trajectory of their lives. They’re known as “the 59ers,” a diverse group of men and women who share a bond that’s not of this world. Rodney Trinidad has met these 59ers time and again as he’s traveled the continent with Samaritan’s Purse and the Billy Graham Evangelistic Association Australia. They’re part of nearly every church congregation in the nation—oftentimes serving as pastors and leaders. And they long to see a move of God like the one they witnessed 60 years ago this month. “When Franklin Graham announced we were coming back to Australia to celebrate the 1959 Crusades of his father, so many 59ers were excited because this was such a significant moment in their life,” Trinidad said. In some ways, this month’s events in half-a-dozen Australian cities will reflect the cultural changes that have taken place over the past 60 years. For instance, the thousand-voice Crusade choirs of the past have been replaced with rock bands like Crowder and the Planetshakers. In other ways, the events of 1959 and 2019 have much in common. Just like the Billy Graham Crusades of the past, Franklin Graham’s events are totally free of charge and open to all. And just like his father, Franklin will share an unchanging Gospel message. 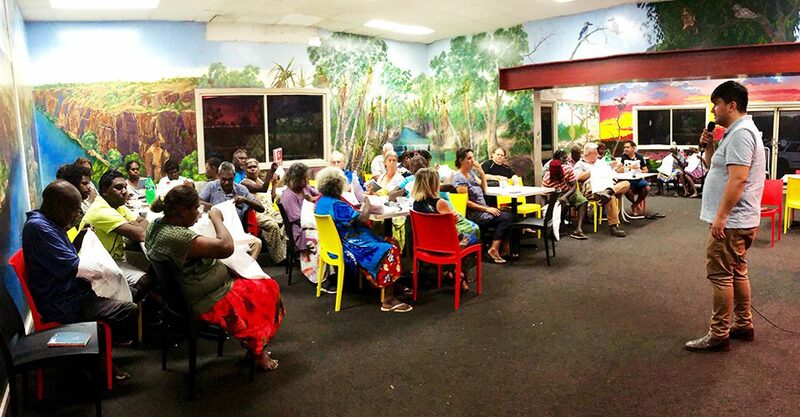 That clear, powerful message of salvation is what’s uniting Australians of all ages. 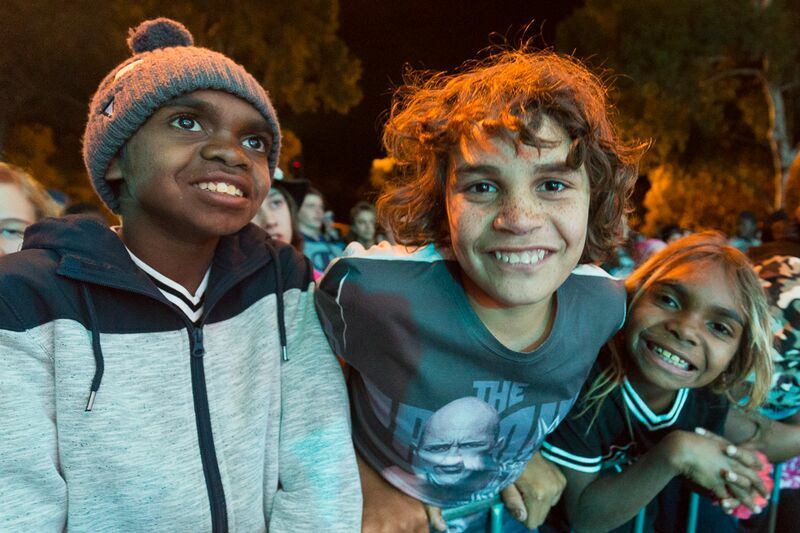 These Australian children enjoyed the music at Will Graham’s 2018 Celebration in Kalgoorlie, Western Australia. This month’s tour with Franklin Graham will bring live music and a message of hope to six cities across the continent. It was the middle of winter in 1959 when Billy Graham kissed his young family goodbye and embarked on the long journey to Australia. He knew he wouldn’t be back until it was nearly summer, a reality that pained him deeply. But he had what he called “an overwhelming desire” to share the Gospel with Australia. It was a strong sense of the Lord’s leading and a remarkable display of unity from the Australian churches that led him to commit to a three-month series of Crusades in the Southern Hemisphere. The result was astounding. In a population of about 10 million, more than 3 million people attended a Crusade event in person. Add in the vast numbers of households listening on the radio, television or over landlines, and it’s estimated that half the population of Australia heard the Gospel of Jesus Christ in 1959. 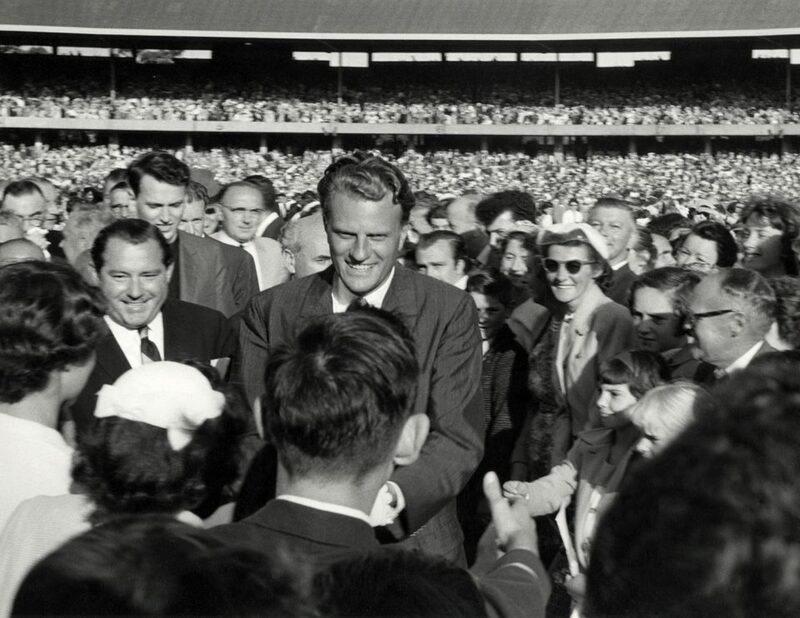 Billy Graham shakes hands with some of the Australians who came to his 1959 Crusade in Melbourne, which shattered the attendance record at the famous Melbourne Cricket Ground. In remote regions of the country, “people were sitting in their churches, and all they had was a picture of Billy Graham and the radio on, and people were coming forward to receive Christ,” Trinidad said. At that time, the Billy Graham Evangelistic Association (BGEA) was just nine years old, and Mr. Graham was 40. He had made headlines for his groundbreaking Crusades in cities like New York and Los Angeles, but he was not yet a household name in other parts of the world. Many Australians believe their nation is ready for revival once again. Since Franklin Graham announced the six-city Graham Tour in honor of the 60th anniversary of his late father’s 1959 Crusades, more than 1,200 churches have joined the mission. More than 1,200 Australian churches are partnering with the Billy Graham Evangelistic Association for the Graham Tour on Feb. 9-24. 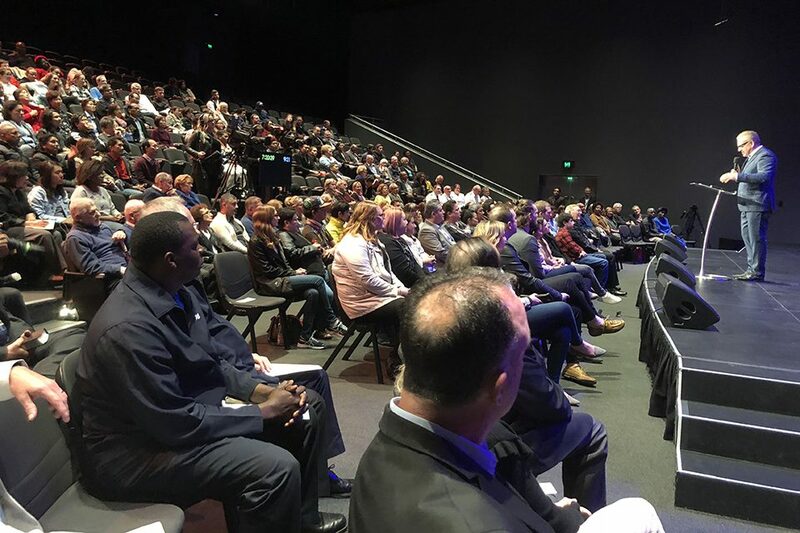 Viktor Hamm, BGEA’s Vice President of Crusade Ministries (pictured onstage) has been traveling to Australia to work with local church leaders. “We pray that God would once again pour out His blessing on this land in a mighty way,” he said. But in the midst of a culture that’s increasingly apathetic about God, a faithful remnant has been praying for the Holy Spirit to wake up the nation. As Rodney Trinidad has trekked across his massive country (roughly the same size as the continental United States) preparing for the Graham Tour, he has witnessed the passionate prayers of Australian believers. More than 10,000 people have taken part in BGEA’s Christian Life and Witness Course, which equips Christ-followers to share their faith. About half of the Australians who’ve completed the course have committed to serve as a prayer volunteer during a tour event in Perth, Darwin, Melbourne, Brisbane, Adelaide or Sydney. Rodney Trinidad (right) has led more than 80 Christian Life and Witness classes throughout Australia. His father was saved after a friend invited him to a Billy Graham Crusade in 1979 in Sydney. Now Trinidad and his wife of 25 years are raising their two daughters to love and serve Jesus Christ. After leading more than 80 classes throughout the past year, Trinidad has been particularly moved by the prayers of teenagers and university students. Many of the young people Trinidad has met are the children and grandchildren of 59ers. Trinidad himself is part of Billy Graham’s legacy for Christ in Australia. His story began two decades after the 1959 Crusades, on one of Mr. Graham’s return trips to the country. A friend had written Trinidad’s father’s name on his prayer list before the Crusade. He carefully planned every detail—getting dinner for the family, arranging transportation to the event—to make sure Trinidad’s father heard the Gospel. As the Graham Tour approaches, Trinidad has been helping his fellow Australian Christians employ the same methods that worked in 1959 and 1979. It starts with writing a name on a piece of paper—and then praying fervently for the Holy Spirit to move in that person’s life. Across the nation, he sees believers pulling out all the stops to reach their friends and neighbors with the love and hope that’s only found in Jesus. And as they cry out to God for the salvation of their loved ones, Trinidad has faith that they will see their prayers answered. “These are real people whose lives and souls are at stake,” he said. “There’s no greater urgency than to pray that God will soften their hearts, that God will allow us to see these people come to faith. 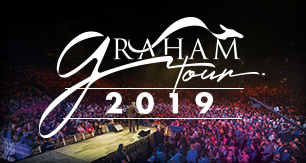 Find out more about the Graham Tour on Feb. 9–24. Learn who Jesus is and what that means for your life. 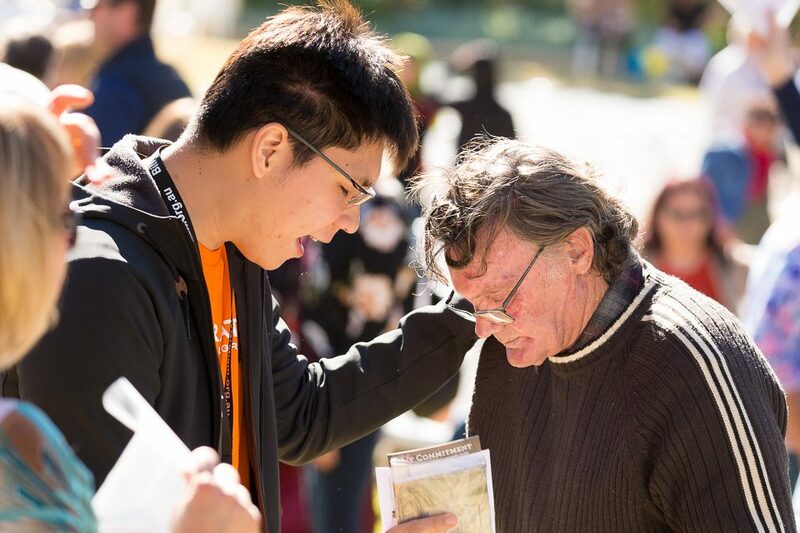 A young prayer volunteer prays with a man at the 2018 Will Graham Celebration in Kalgoorlie, Western Australia. More than 5,000 people have signed up to serve as prayer volunteers for the Graham Tour this month. Franklin Graham is honoring the 60th anniversary of his father’s historic outreach by holding his own evangelistic events across six Australia cities to share the Good News of Jesus Christ.